Since the time I was in preschool, I have always looked forward to the start of a new school year. At that time I was anxious to socialize with friends and see who had the greatest show n tell. When I was a young mother I relished the thought of back-to-school so that I could have a bit of time to myself after a summer of chauffeuring children to various outings. Now I actually look forward to meeting new students and teaching familiar lessons. While I love ALL the back-to school shopping and stocking up on the necessary office supplies, there is somehow nothing as symbolic of a fresh start as a new box of crayons. The uniform points ensure that all marks will stay within the lines; the vibrant colors are reminiscent of the rebirth of spring and the bounty of summer; and the varied assortment opens the imagination to unlimited possibilities for creativity. 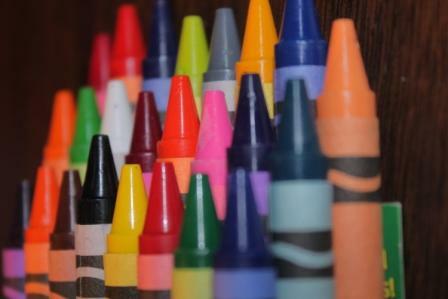 I have never been much of an artist, but I have always enjoyed crayons. There is something very soothing and meditative about shading the empty space with a pastel wash or a bold splash of color. The other day I could not remember what I enjoyed doing when I was ten or eleven years old besides playing school, but now I remember that coloring was high on the list as well. Perhaps I should try to find a holiday coloring book the next time I am out and begin to reconnect with that inner child. I agree. The first day of school, everything feels fresh and new. I simply adore a new box of crayons (was thinking of blogging about them myself) and all the possibilities they bring. I pull the box and some coloring books out when children are around and it seems it is always the adults that start coloring. Ah. How I miss the back to school shopping for supplies — now, I just focus on office supply purchases for me! I've always loved back to school time. This is the first fall in years that my son won't be going to school and it makes me sad and happy at the same time. Oh, Fall is my favorite season for all those reasons you listed. I so loved the beginnings symbolized by the start of a school year—even long after I no longer went to school or had kids who did. Now my grandkids are enjoying their school days. They get excited about the new clothes and supplies, just as I did. I even loved the scent of the school buildings after being away for a couple of months. Hope your school season is great! I too was always a huge fan of the beginning of school. First, because I am a nerd. Second, because I love love love school supplies. And I love a new box of crayons. Since I had my son, I've gotten in touch with my inner crayoner … but once they lose that point, they just aren't as good. The new box of crayons. So exciting! Definitely the scent of possibility. My 15yo still loves to get coloring books and color with a friend. So much so that for her birthday, she got a huge new box of crayons even though we are still working our way through the bin of crayons that survived each year of grade school. And I haven't had a kid in grade school in four years!